Create Mood and Atmosphere with our Exclusive Range, Ideal for Bedrooms Add Ambience to any Room with Our Micro Battery Powered Lights. Easy to Use, Last for Ages. Add Lighting, Colour, and Illuminate any Indoor Room, Battery Fairy Lights can be a Very Easy and Effective way to help Design and Enhance Interiors. Our Fairy Lights can be Charged Quickly through the USB Cables Provided. The Battery will also be long-lasting, providing you with the light that you need for an extended period. It consumes energy efficiently as against those that continuously runs on electricity. Lastly, our indoor battery fairy lights are made with the use of premium materials, which are meant to withstand the test of time. 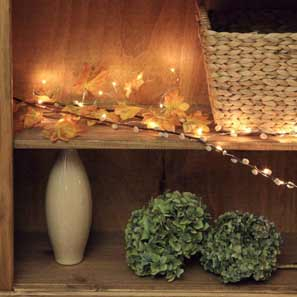 Most of all, our indoor battery fairy lights are affordable. Even if you dare to compare, you will realise that we have economical prices, which are hard to rival by our competitors. This, however, does not mean that quality is being compromised in any way. One of the best ways to use indoor battery fairy lights is to have it hang as a drapery. You can use it on the posts of your bed, which will surely make you feel like a princess. If you do not have a canopy bed, you can improvise hooks on the ceiling and hang draperies and string lights. Another thing that can be done with indoor battery fairy lights is to have it glued on the ceiling. You can use double-sided tapes and hooks in order to have them fixed. When you sleep at night, you will feel like you are sleeping under the stars. If you have plants in the living room, you can also use indoor battery fairy lights. Make sure that it is placed in a part of the house that is dim, which will make the light stand out. Lastly, you can also use indoor battery fairy lights as wall art. You can use it to personalise your walls and write short words, such as DREAM or LOVE.